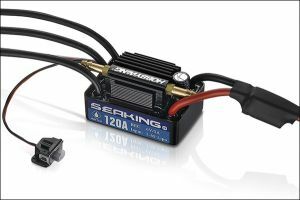 Hobby Wing "SeaKing" 120 v3 Amp ESC. 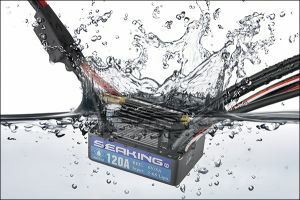 $7 off shipping and handling on any order that contains a seaking 120, 160 or 180 esc. Use Coupon code Seaking. This is boat model esc is specially designed for boat use with water-cooling system. Excellent waterproof design (rates as IP 67) allows this ESC to work in water without any extra precautions. High quality components have very strong over-current withstanding capabilities. Patented Copper Heat Conduction technology and high-efficiency water cooling system can easily dissipate the heat produced in operation under high load. The special firmware designed for RC boats can make the acceleration punchier and the sailing more stable. The External Programming Port can connect to the LED Program Box for easily setting the parameters of the ESC. Multiple protections like low-voltage cutoff protection, thermal protection and throttle signal loss protection, make the ESC more reliable. Includes 4mm Female Bullet connectors soldered on motor side : NO connectors on battery side. This esc was designed to work in an environment where its possible for the esc to get wet on occasion. Not for use underwater. OSE does not suggest using this item under water! !